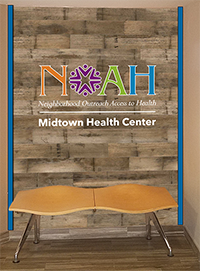 “I’m especially proud of the #teen #award as it’s our 4th year in a row for NOAH Heuser Family Medicine Center. Our staff are doing an amazing job in promoting & educating our patients about vaccinations. We’re doing our part to #immunize those that are able to receive #vaccines,” says Melody Dockery-Chleva, Practice Manager at NOAH Heuser Family Medicine Center. Are your child’s #vaccinations up to date? Schedule an annual well-child visit & find out! Don’t forget to bring your #shotrecords. To schedule an apt., please call 480-882-4545! Our NOAH Care Team was out at the The Salvation Army Ray & Joan Kroc Center of Phoenix South Mountain hosting a resource table and scheduling #dental follow up care appointments for many of the #children in need of a dental home this weekend. A special thanks to our partner, TeamSmile + Arizona Cardinals TeamSmile for allowing us to be part of such an amazing event and opportunity to serve more families in our community. Schedule your dental hygiene apt. at 480-882-4545 today!